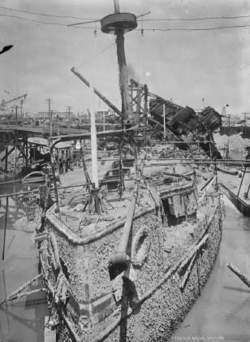 The wreckage of the USS Maine in Havana Harbor. The destruction of this ship led to the Spanish-American War. One theory about the explosion that killed 260 sailors is that American saboteurs orchestrated it to start the war. For over a hundred years the outraged cry of “Remember the Maine!” has echoed in the halls of U.S. history. But even today people can’t agree on who or what sank the battleship. When the USS Maine blew up in Havana harbor on the evening of February 15, 1898, most of the battleship’s crew were sleeping or relaxing in the enlisted men’s quarters in the forward part of the ship. Later investigation disclosed that five tons of powder charges for the battleship’s six and ten-inch guns exploded, substantially obliterating the forward third of the ship and sending the remaining wreckage quickly to the bottom of the harbor. Two hundred and sixty-six men lost their lives in the blast or within minutes of it, and another six died later from injuries. Captain Charles Sigsbee and most of the officers of the vessel survived the disaster because their quarters were in the rear portion of the battleship. The United States had been in sympathetic support of the Cubans in their struggle for freedom from Spain ever since the first insurrection, between 1868 and 1878. On October 31, 1873, the Spanish captured the ship Virginius, bringing aid and guns to the embattled Cuban revolutionaries, and executed most of the crew, including many American citizens. A declaration of war with Spain had been swaying on the brink ever since the Virginius incident, and popular sentiment in the United States to go to war was steadily fueled by the “yellow press” with accounts of horrible atrocities against the Cubans by the Spanish. When the second rebellion began in April 1895, Spain sent General Valeriano Weyler y Nicolau, soon to be known as “the Butcher,” to quell the disturbances, and stories about death and starvation of Cubans soon saturated American newspapers. Pressure had been placed on both President Grover Cleveland (1884–88; 1893–97) and William McKinley (1897–1901) to declare war on Spain, but both men had preferred to employ diplomacy. In 1897 Spain promised limited autonomy for Cuba, but the U.S. government was well aware that the revolutionaries would settle for nothing less than total independence. After riots broke out in Cuba in January 1898, President McKinley sent the USS Maine to be at hand if the Americans on the island should need protecting. The battleship arrived at Havana on January 25, 1898, after an anxious Spain was notified of U.S. intentions. Although suspicious of America’s true motives, the Spanish authorities allowed the ship to enter the harbor. Captain Sigsbee, attuned to any potential mis-step on a sensitive mission, did not allow any of his enlisted men to go on shore. Then, on February 15, the Maine was destroyed in one horrendous explosion. Spanish officials and the crew of the civilian steamer City of Washington were quickly at hand to rescue the survivors and look after the wounded. The genuine solicitude of the Spanish authorities allayed Sigsbee’s initial suspicions of a hostile action against the Maine, and his first telegram to the U.S. Navy Department urged suspension of public opinion until a suitable inquiry had been made. President McKinley continued his efforts for a diplomatic settlement between Spain and Cuba but was finally pressured into ordering a blockade of Cuba on April 21. With diplomacy at an impasse, Spain declared war on the United States on April 23. Congress was ready with its own declaration of war on April 25 and made it retroactive to April 21. The Spanish-American War lasted only five months (April 21 to August 13, 1898), but it signaled the emergence of the United States as a world power. For over a hundred years, conspiracy theorists have argued that warmongers in the United States sabotaged the Maine to force the nation to declare war on Spain. The possibility that someone on board the battleship might have ignited five tons of powder charges and killed 266 of his fellow crewmen was investigated by a Navy Department inquiry in 1911. There were solid arguments presented that a mine external to the Maine caused the blast; there was also evidence that spontaneous combustion of coal in the bunker next to the powder magazine caused the explosion. In 1976 Admiral Hyman Rickover of the U.S. Navy published the results of an investigation that concluded the explosion was the result of a coal bunker fire. A number of historians doubted this theory, still maintaining that the blast was caused by sabotage. In 1998 the National Geographic Society explored the wreck and decided that based on a structural analysis, the tragedy could have been caused by the ignition of volatile coal dust in a bunker. At this late date we will probably never know the truth of what happened that February night in Havana harbor in 1898, but we can be certain that the controversy will linger on. The American public reacted with outrage in the aftermath of the violent and mysterious sinking of the U. The Spanish Government finally granted the request and the Battleship U. As Alyn Brodsky recounts in Grover Cleveland: A Study in Character, he believed it would be "an outrage to declare war" on Spain even after the sinking of the U. Herring, there was no need to "sell" the Spanish-American War to the masses because of "yellow journalism," the insulting DeLome letter, and the sinking of the U. She has produced more than 30 science documentaries for public television, including the award-winning Superbugs: The Killer Viruses and Search for the U. Also potently told is the publisher's still-shocking exploitation of the Spanish-American War, fueling public rage at the sinking of the U.
Iowa (BB-4), was senior captain of the North Atlantic Squadron; president of the board investigating the loss of U. The afterword briefly wraps up several loose ends, ranging from the Panama Canal to the Philippines, from Emma Goldman's later life to the current consensus about the sinking of the U. 16 producer Martha Bone has been honored by the 2002 Aurora Awards Film and Video competition for her work on Search for the U. Bone also won a Bronze Telly Award for Search for the U. The most recent example of this is "Search for the U.
next door to the Hilton) is housed in the Old Customs House and features touring exhibits on the first floor and a permanent exhibit, which commemorates the 1898 sinking of the battleship U.